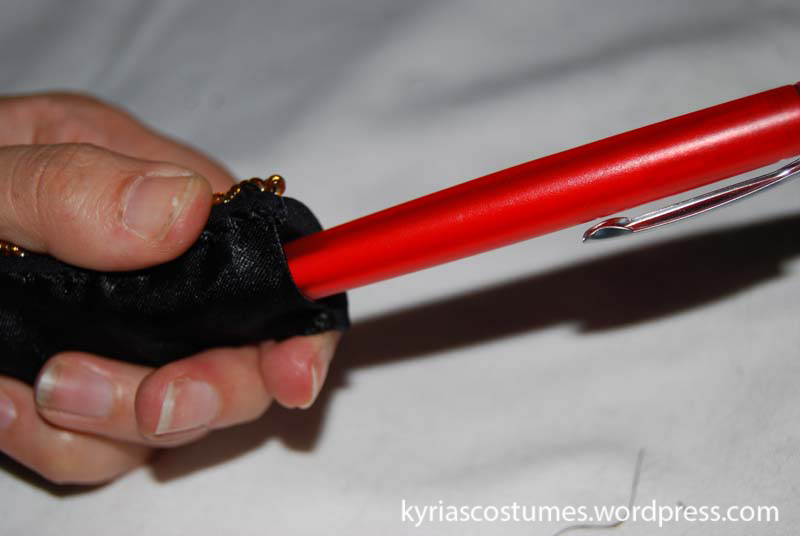 The idea of this costume came to me when I was digging through the piles of fabric that I have in my fabric stash. 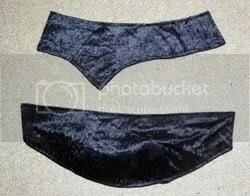 About 6 years ago I bought heavy, luxurious black stretch velvet and started making a catsuit out of it, but never finished it. 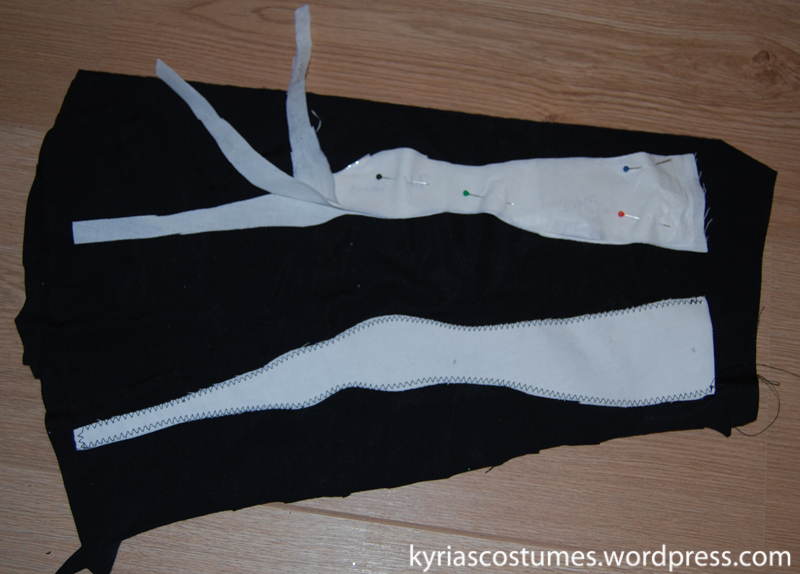 The catsuit is still almost done, so I’m going to use the bottom part as pants for this costume. I also bought purple/pink/black iridiscent fabric two years ago, because it’s so shiny and I wanted it. the rhinestone chain came into view when I vistited a local craft store who sells expensive sewing stuff. I decided to go for the minimalistic look, mainly because the fabric is so lush. 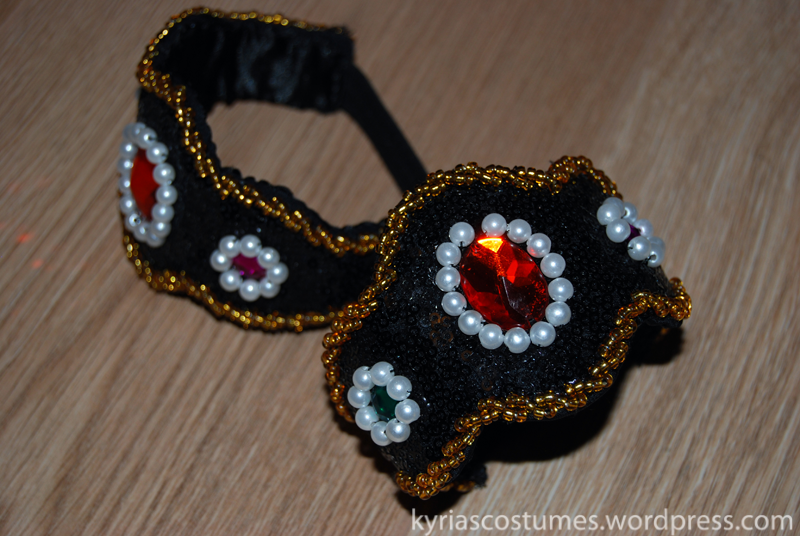 The rhinestones really stand out (there is a strand in the draped part too, but it don’t show well in the picture). 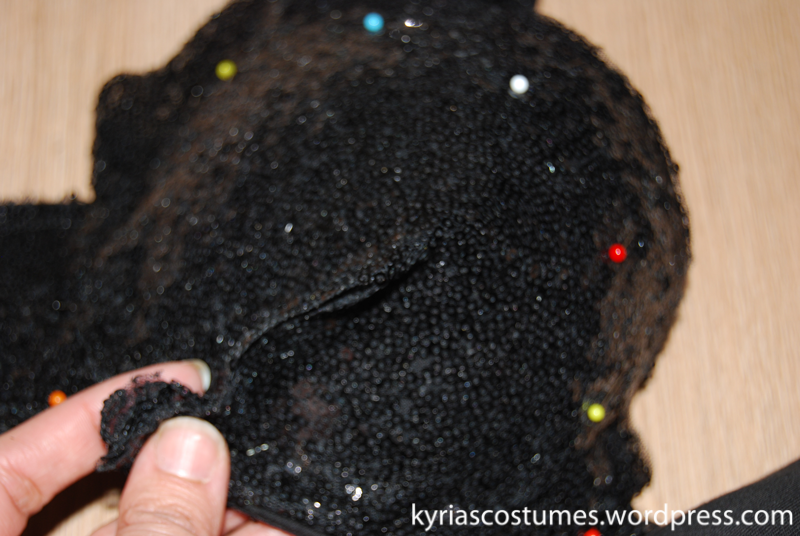 The bra is almost finished by now. 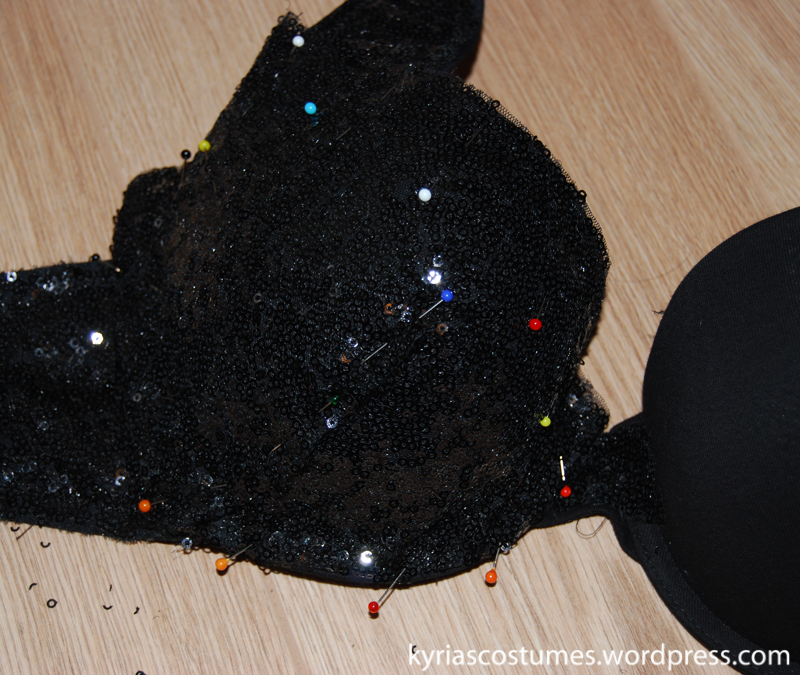 This is the bra laid out on the floor. 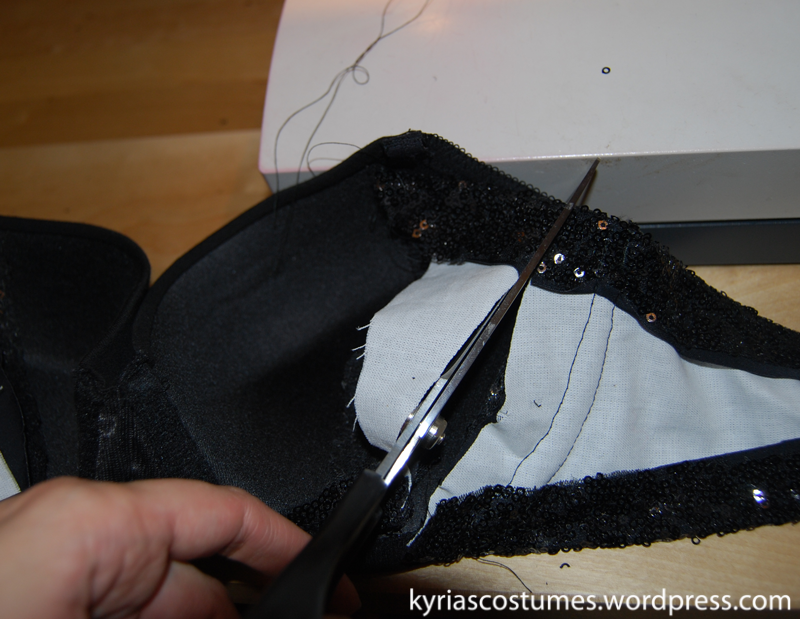 It’s a hard cup bra, reinforced with wire and sturdy enough to wear as a n almost strapless bra. this is me, wearing the bra. 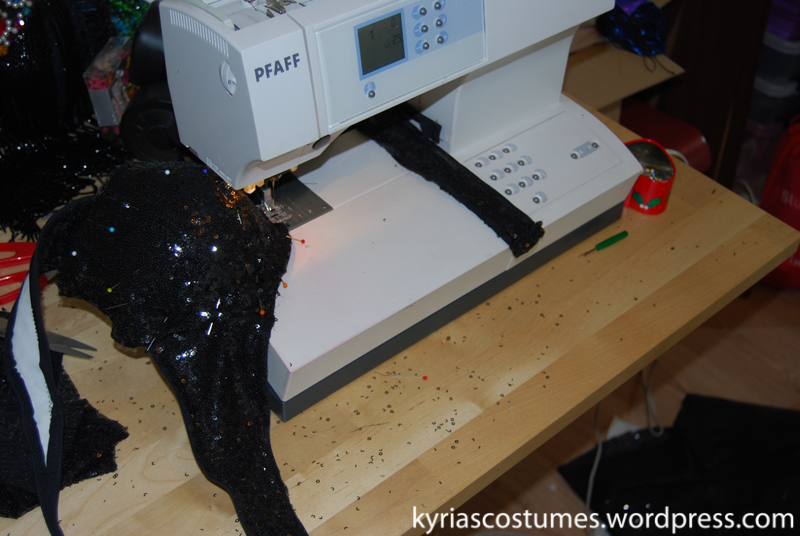 I’m adding an assymetrical strap with a rhinestone chain on it from the middle of the bra over one shoulder. ALways loved the one strap look, Jillina’s costume on one of her instructional dvd’s made me think serious about it, because it worked for her, why couldn’t it work for me? 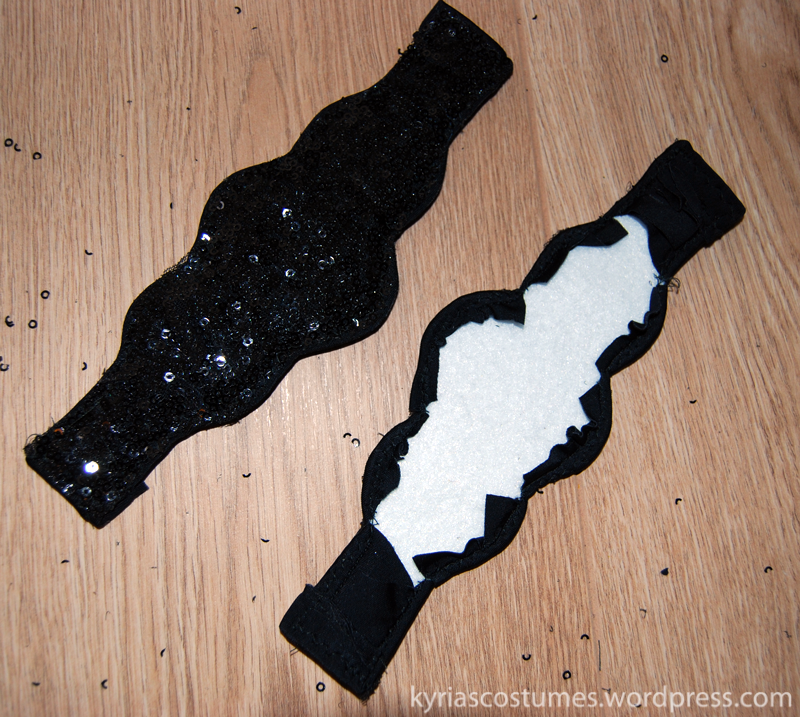 I want to hang some rhinestone loops from the bottom of one half to the back for some added sparkle and move. You can see how it site on me. 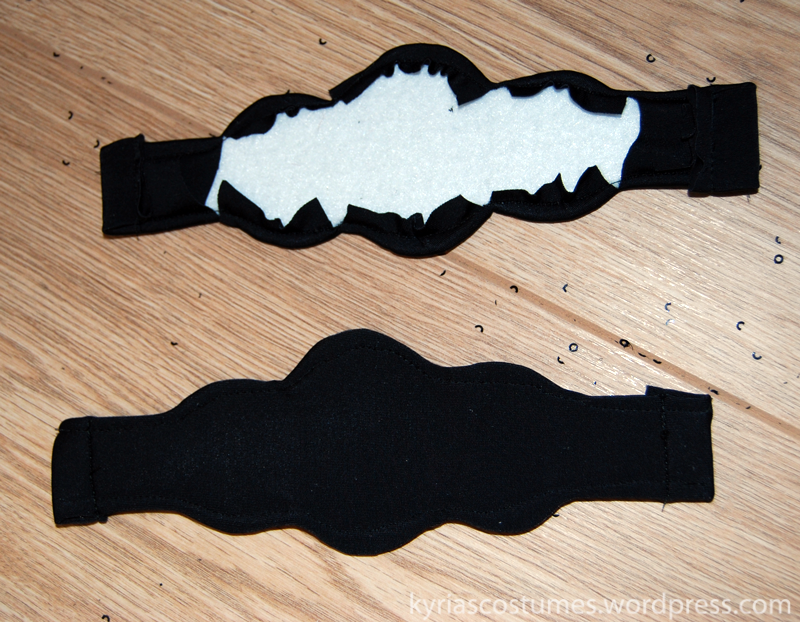 It needs a little padding, but it stays put when I move around and I have no major gap/spill so the basic shape is good. 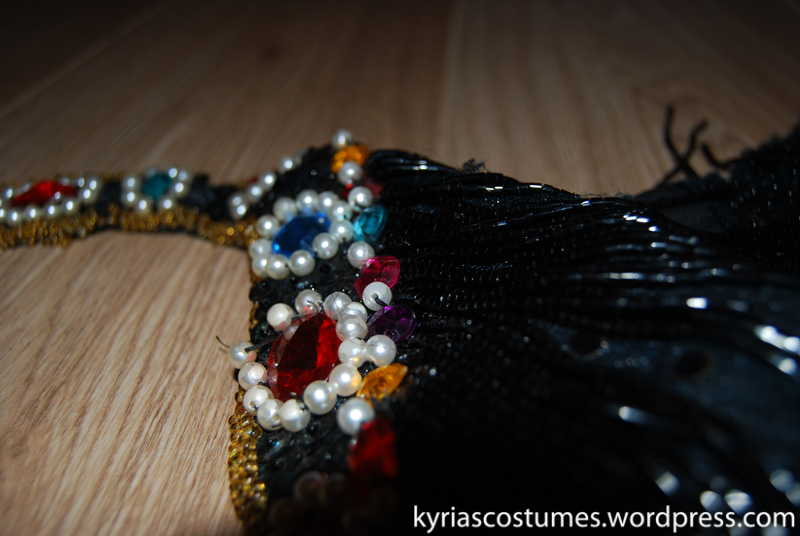 I’m not sure about the acrylic jewels, I think I’m going to remove them because they are too shiny and gaudy for this costume. Whaddaya think? Working on this one got me some more ideas in my head. 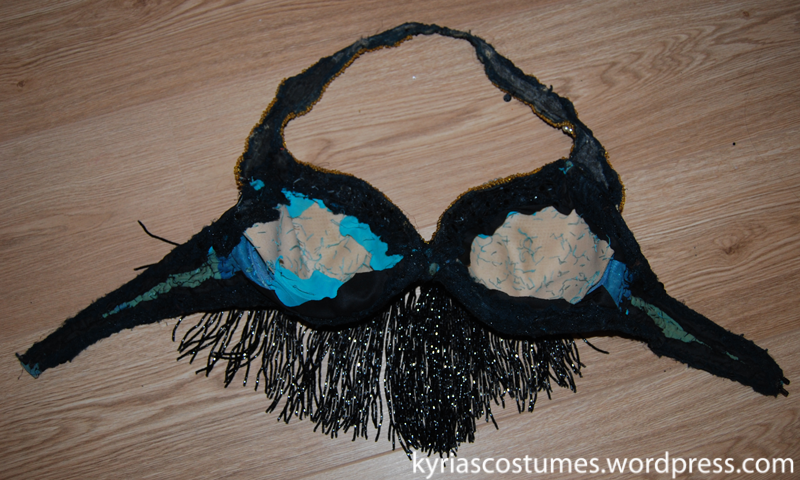 The bra is progressing faster then I expected, when I made the drawing I expected that it would take much longer. This cossie needs a sleek choreo with a lot of fast, snakelike move, leaning towards modern dance, or something with arabic pop. No, no pictures of the rest. I haven’t scanned the drawing, but to give you a general idea: black velvet bellbottom pants with build in zipper. The purple iridiscent fabric will be draped from one hip on the front towards the other hip on the back. 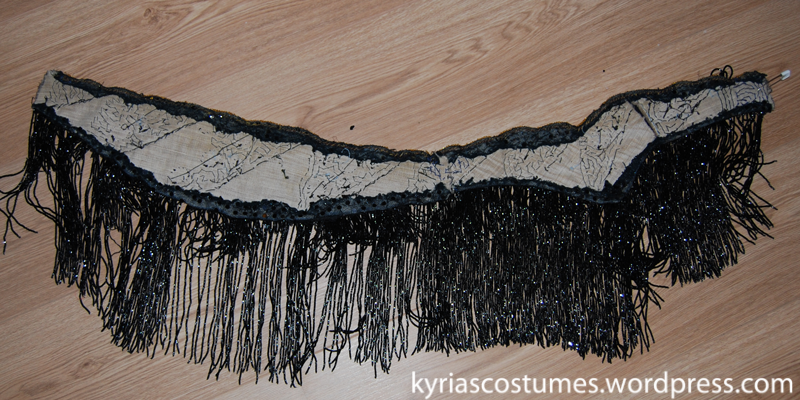 I intend to stitch it and leave the zipper open, then use a clasp construction to hide the zipper iunderneath the drape. 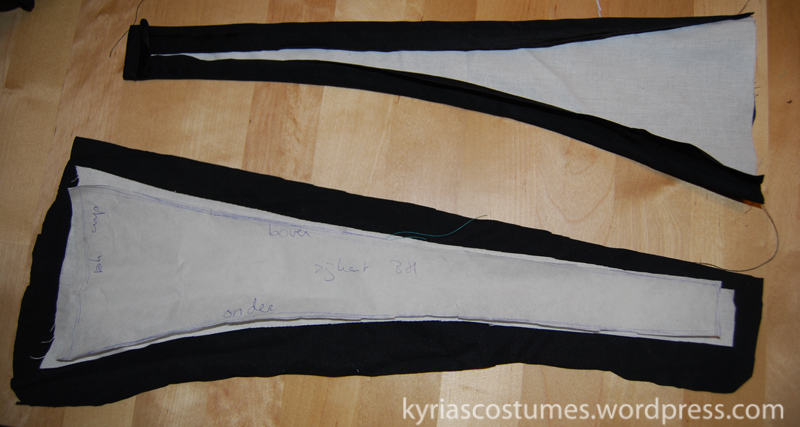 The drape will end in a loose end of hanging fabric (midcalf length). 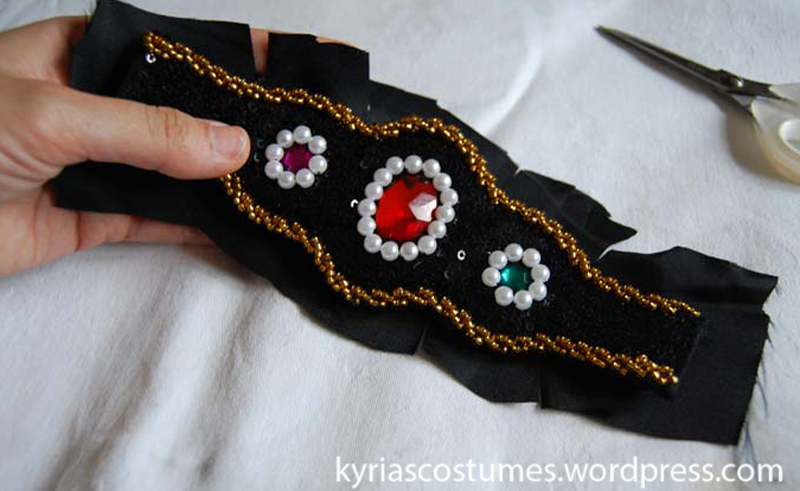 I want one upperarmband with a piece of iridescent fabric attatched to fly around when I dance, a wristband for the other arm and I want to incorporate silver beaded fringe in the pants. Don’t know wether it will be a row or clumps, loops or hanging, we’ll see.